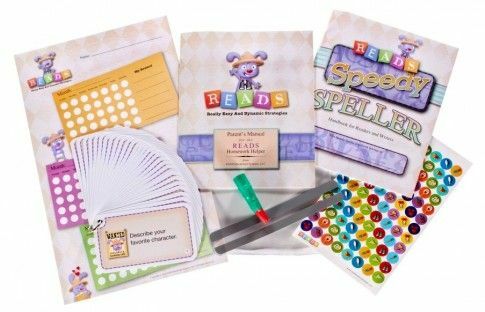 READS Parent/Child Reading Comprehension System is a homework helper supplemental program designed by EGM Educational Systems, LLC to help parents encourage their to children become independent learners! A great additon to any reading program. When children are in the grades between 1 and 4, their reading and writing skills are developed and strengthened. Children are usually required to read, at home, for at least 20 minutes on their own. This program helps to make their reading time fun, engaging and successful. How many times has your child read a book and you asked them, "what was the book about" and the only response was a shrug of the shoulders. This program helps to eliminate this scenario and allows parents to help their children with reading comprehension skills! Remember when you first started reading to your child? You probably used your finger as a guide to help them follow along. This package includes what they call the "magic finger" that the child can use to help them keep their place while reading. Also included is a reading guide strip that the reader places on the sentence they are reading so they don't lose their place. How many times has your child read to you only to re-read the same sentence several times because they were confused as to where they were at in the story? My son seemed to prefer the finger over the reading strip because it was fun and engaging but I could see how the reading strip would be successful for many students! What I love about this program is it seems to help with the transition from reading with a parent to reading on their own. When I would first have my first grader go off and read on his own he would pick the shortest, easiest book because he wanted to take a short cut. Since I've started the READS program, he actually enjoys reading and doesn't try to simply take the easy way out. I enjoyed the interaction encouraged between the parent and child in this program. It causes the child to be involved, engaged and thinking. Before the child begins reading the parents allows the student to choose a question card to think about throughout the reading. These question cards and the sticker reward chart are my son's favorite aspects of this program. This is definitely a program I will continue to use throughout the year and am excited to do so! Pictured below is the speedy speller which is perfect for my son! If your child needs help spelling a word when answering their READS question, this "mini dictionary" is perfect for little hands! Actually, we use this in other subjects in our homeschool because of the perfect selection of words in this speller. It isn't overwhelming and easy for a beginner to use! My son loves to write, but spelling is a challenge. This speller helps him tremendously! All in all this program is a great supplement whether your child is in public school, private school or a homeschooled! This is not a curriculum but can be used with any reading program that your child is already using. Excellent materials that can be sued year after year for a great price!